As an artist, I think of opal as a bridge between the two elements of fire and water. I think of opal birthstone as a paradox, and a talisman of hope; a spark of light where there should be none. Why? Because aside from random artistic visions, opals are literally formed by water carrying microscopic particles of silica – of possibilities – flowing over cracks and into seams. As the water evaporates, the silica is left behind, creating beautiful plays of light and of color in the darkness. Possibilities where there had been none- I think that is the embodiment of optimism, and what fascinates me about opals. Birthstone for October, along with Tourmaline. Opals have had a varied reputation throughout history. Historically, Romans carried them as good luck talismans, Greeks believed them to provide foresight, and Arab lore held that opals originated as flashes of lightning. But they’re also the villain in many a tale, and have been plagued by superstition over the years. Black opals were thought to be used to focus magic powers and might even be used to invoke invisibility or teleportation! Looks like magic to me! Want to know more about the history of opals? Here are a couple of interesting articles I came across: Opal history and lore and Are opals bad luck? 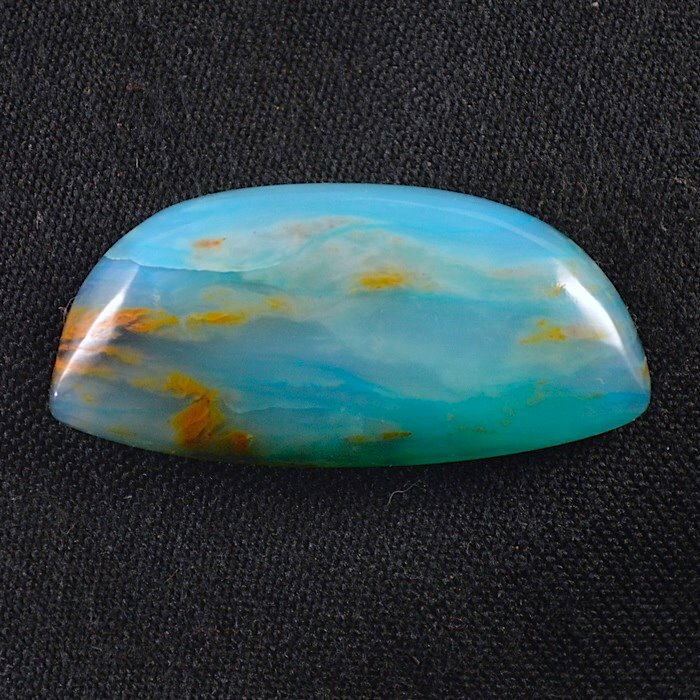 How is this mysterious and beautiful stone created? I touched on this in the beginning, but here’s how opals are formed. Picture water running over sandstone. The water dissolves the silica (particles that are the basic component of rocks, sand, and soil) and carries it along. As the water runs over the rock and stone, it deposits these tiny particles into cracks and fissures. Over time, the water evaporates and leaves behind the fiery play-of-color substance that we know as Opal. Play of color, otherwise known as opalescence, may show up as one big flash of color or multiple small flashes. These flashes change with the viewing angle of the stone. But what causes the flashes? There is a very full explanation here, but I’ll give you the short version. If you look at an opal under a microscope, you’ll see a bunch of spheres. Imagine a school gym or the toy department at the department store, and those cages where they keep the balls so they don’t escape. You’ll see spaces between the balls. That’s similar to the interior structure of an opal; stacked spheres. Between the spheres, in the tiny gaps, there remains water and silica. When white light waves enter an opal, they bounce (refract) and pass through the spheres and the gaps between them. As they pass through, they split (diffract) into all the colors of the spectrum and bounce back out, and that’s when we see the flash of color. Which color we see depends on the size of the spheres and how close they are together. 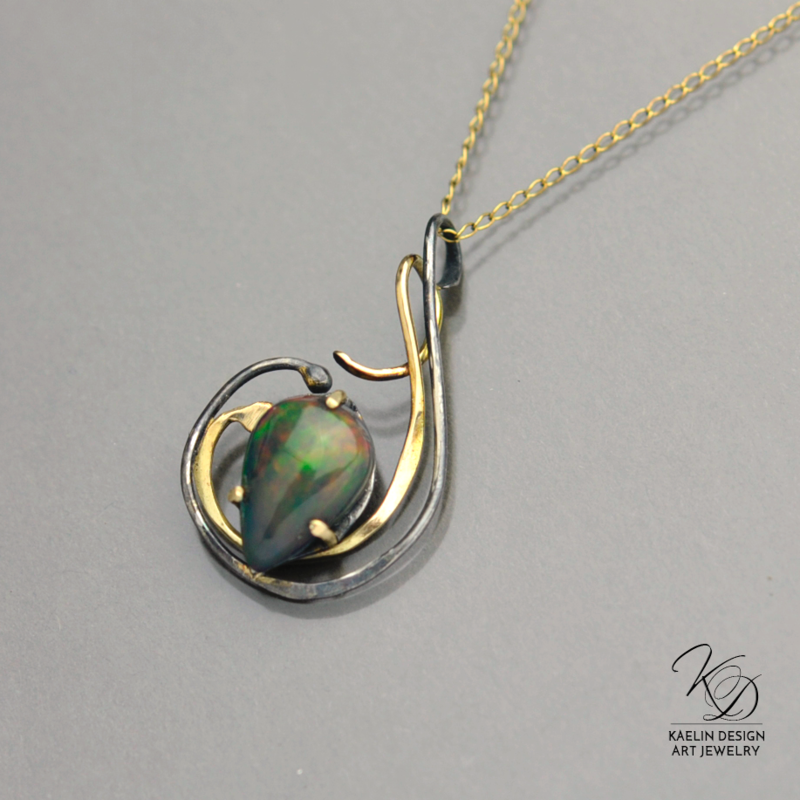 Play-of-color or fire references the shifting colors of the opal. Some varieties have little to no fire at all, while others are renowned for their vibrancy. The body of the opal refers to the main substance of the opal which generally gives it its primary base color. Crystal Opals are any opals that are transparent, and have a light translucent or light semi-translucent body. Jelly Opals are any opals that have a dark translucent or dark semi-translucent body. Seam Opals are opals that were formed when the silica ran down a seam in the surrounding rock. You can get some really neat patterning with this! Boulder opals are one example. Matrix refers to opal that’s mixed with the host rock where it is found. 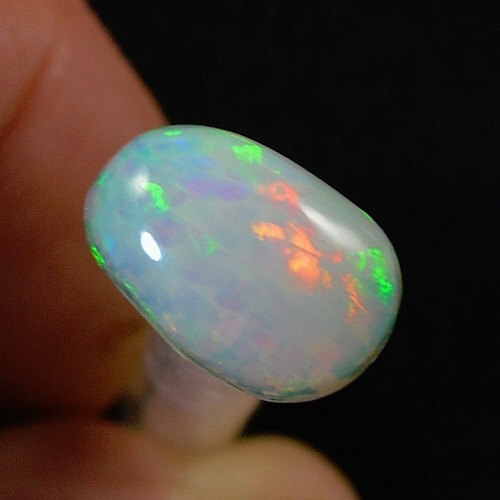 The opal is cut with the other stone, rather than cut out of it. This produces some unique and interesting patterns. Crazing is a condition common in certain types of opals that causes them to spontaneously form internal cracks. It usually occurs when an opal dries too quickly, or is exposed to sudden intense light, or vibration. I don’t know about you, but I adore opals. And there are SO many varieties to love! 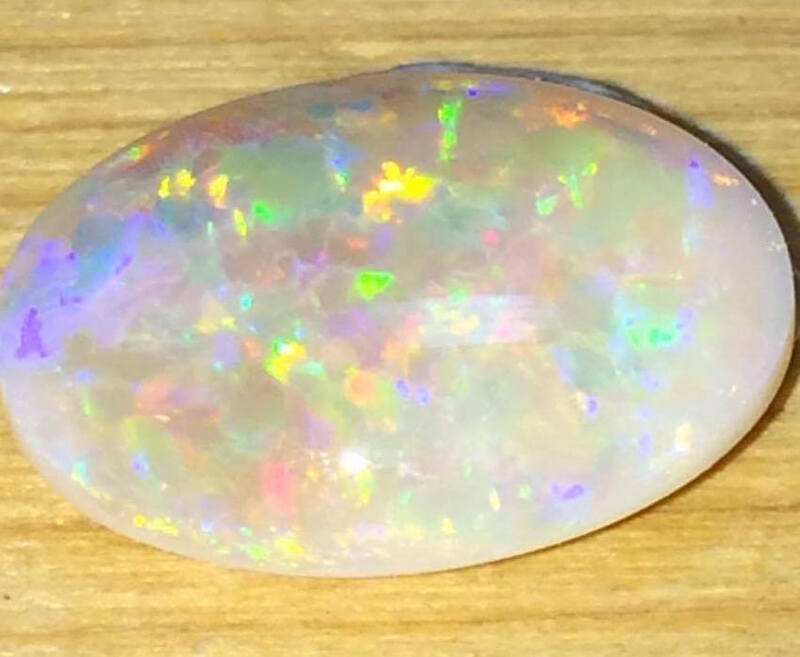 Most people think only of precious opal: that white base that sparkles with a rainbow of color and pinfires of brilliance. It’s gorgeous, I’ll admit, but there are so many more- over 100 in fact! But I’m going to talk about the ones that are most commonly used in designer Art Jewelry. Opals come in all colors and sheens, and are found all over the world- and beyond. In 2008, NASA even found opal deposits on Mars! However, on Earth, common opal refers to opal that does not have the play of color of precious opal. You will also find this type of Opal sometimes labeled “potch”, but this term can also refer to the matrix that Precious Opal is formed in. Common opal can still be beautiful, even if it doesn’t have the opalescence of precious opal. Peruvian Opal, pictured above, is an example of common opal, which comes in pink and blue- and is one of my new favorites. It has translucent qualities, and often appears to flow over and around it’s surrounding stone. Dendritic Opal is another variety of common opal that has tubes or plumes of manganese dendrites interspersed throughout that look like trees or feathers. Precious opal, on the other hand, is characterized by that very play-of-color, or “opalescence”. From geology.com: “The desirability of opal is based upon color Intensity, diversity, uniformity, pattern and ability to be seen from any angle.” Precious opal generally has a white body color, and can have the best range of color. It’s also the most popular and widely used opal. 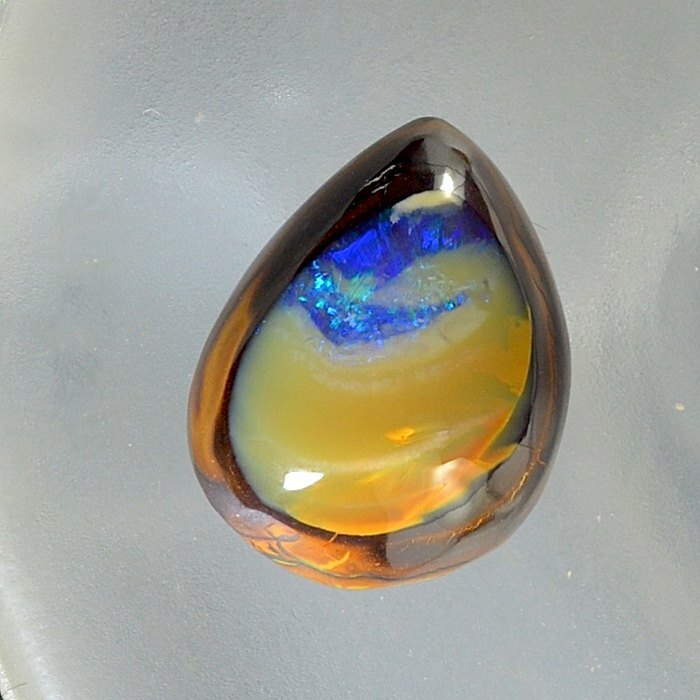 There are several variations that are highly sought after by collectors; black opal, honeycomb opal, and harlequin opal. Black opal is precious opal with a black or gray body tone. Natural Black Opal is the rarest and most prized of all the opals, and is highly sought after. 97% of the world’s supply of black opals come from Australia, but beautiful specimens are also found in Virgin Valley, Nevada. Honeycomb Opal also displays unusual patterning, similar to a honeycomb, filled with distinctive blocks of color. The pattern is caused by the opal forming in long tubes or ‘fingers’, forming it’s unique pattern. This variety of opal is found in Queensland, Australia, embedded in Ironstone boulders. 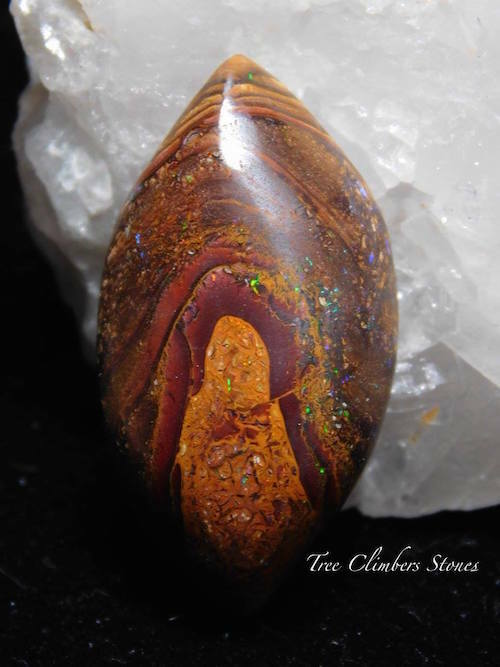 All varieties of Boulder Opal are backed with ironstone, which generally gives the stone a darker body tone, similar to Black Opals. This darker tone allows the play-of-color to be brighter, and more fiery. Boulder Opal in general has a magnificent range of colors, and the more of the stone that shows play of color Opal, instead of ironstone, the better quality it is considered to be. This type of opal may cost up to $3000 per carat. Two sub-varieties of boulder opal that you may come across are Yowah Opal Nuts, and Koroit Boulder Opal. Yowah Opal Nuts are small ironstone rocks, generally about the size of an apricot kernel, that are found around the town of Yowah, Australia. These small ‘nuts’ harbored a pool of silica-rich water at some point, or had water seep into the center, which dried and solidified into opal. Cutting open these nuts can reveal layers of brown patterned stone around a core of stunning play-of-color opal. 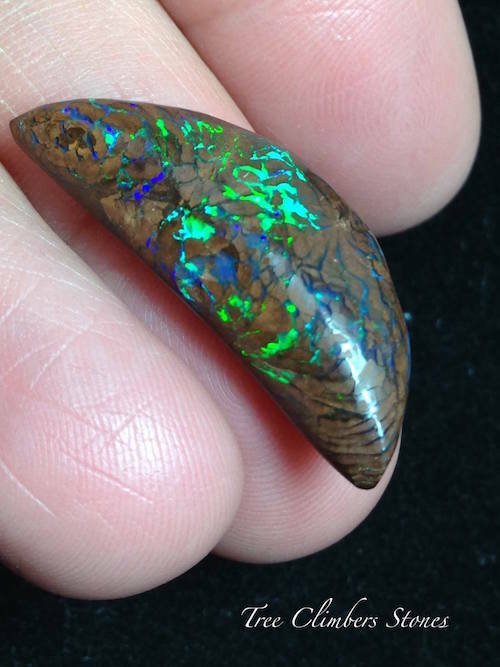 Koroit Opal is boulder opal that’s named after the Koroit region in Australia, and is generally characterized by complicated veins of opal running through highly patterned ironstone matrix. In this case, the unusual patterning of both the ironstone and the opal is much prized by collectors. Found in the Welo region of Ethiopia, this hydrophane opal(an opal that becomes transparent in water) is characterized by a light background and vivid play of color. This variety was recently discovered in 2008, and should not be confused with the Ethiopian opal deposits discovered in 1993, which can be prone to cracking. Welo Opal is extremely durable for an Opal, and is taking the jewelry industry by storm with it’s amazing play of color. 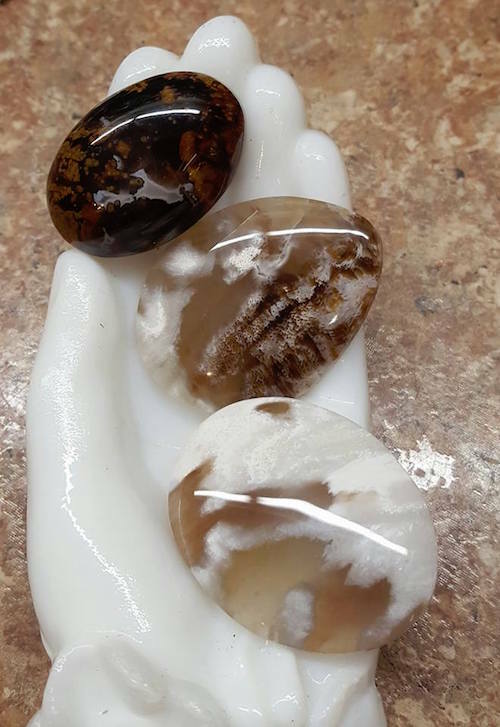 Occasionally in the fossilization and formation process, silica rich fluid flowed into-and replaced!- segments of an object as it was worn away, as in the case of the petrified wood cabochons above. This process also happened with shells, agates, dinosaur bones, teeth, and other fossils. Opal truly will go anywhere and everywhere it can! Opal jewelry requires different care than most other jewelry, because of the water content in each stone. Opals continue to dry out as they age, and can develop cracks and craze lines. To prevent this, Opal jewelry should always be stored in humid conditions. Unfortunately, the same humid conditions opals love is also the same conditions that cause tarnish. For this reason, high-karat gold ,platinum alloy, or anti-tarnish Argentium Silver settings, (like I use in my Opal jewelry), are recommended. Opals are also comparatively soft- between 5.5 and 6.5 on the MOHS scale, which is about the same hardness as glass. They should be stored separately from other jewelry which will scratch and damage your opals. Unless the stone is a triplet, I do not recommend any opals for rings or bracelets, where they may get knocked, or damaged. Storage: Except for doublets/triplets, keep them moist. Store in damp cotton. Cleaning: Never use harsh chemicals or ultrasonic cleaning. NEVER STEAM. Clean with mild soap and water. More tips about caring for art jewelry here. Now, because Opal is so soft, and yet so beautiful, people have devised a number of treatments to make it stronger and enhance it’s natural beauty. It’s quite understandable- and somewhat common place, but as with everything else, it should always be disclosed as it does lessen the value of the stone. All of these treatments can be identified under magnification by your local reputable jeweler. Filling – Opal of all types can dry out and show small surface cracks. To offset this, or to stabilize a weaker stone, opals are sometimes treated with colorless wax, oil, plastic or other hardeners. Smoking – Placing an opal in brown paper then charring it allows the soot particles to penetrate into the opal, darkening the body and enhancing the play of color. If you were to wet a smoked opal, the play of color would diminish, but would return when the opal dried. Sugar treatment – Also used to intensify play of color in porous opal, this treatment is more common than smoking. The opal is placed in a sugar/acid solution which it absorbs, heated to solidify the sugar, then removed, cooled, and placed in concentrated sulfuric acid to burn the sugar to carbon. Sometimes the layer of opal is not thick enough to produce a solid stone, so it’s combined with a layer of darker material, such as black common opal, ironstone, or obsidian. This is what’s known as a doublet. When a clear layer is added on top, such as plastic or quartz, it becomes a triplet. This layer protects the opal beneath, allowing the opal to be safely used in applications such as rings and bracelets. Doubleting or Tripleting causes the opal to be considered less valuable, because there is generally less actual opal involved. However, this can make a more fiery gem more affordable, or strengthen the stone for more rigorous applications. I want to thank Tree Climbers Stones, Stones In Motion, San Antonio Silver, Donna’s Gems, and Dave Leininger of NWAGMS for allowing me to feature some of their gorgeous Opals today. This is just the tip of the iceberg when it comes to opals- there are so many gorgeous varieties to be discovered, and I’ve covered just a few here. I love opals of all kinds, and as you can tell from my Fire Opals- I have quite a few! If there’s anything about opals that you want to know that I didn’t cover- or you’d like one of the opals shown from my collection in a custom pendant– please leave a comment, and I’ll be happy to help! One of the most informative and well written articles I have ever read. Beautifully written Kaelin! Well done!! Thank you Esther- I’m so glad you enjoyed it! Beautifully written article Kaelin! I enjoyed it very much! Very well put together it leads you through the article. Well done my friend! I love opals, and thoroughly enjoyed reading these descriptions!